E Logs for truckers may also becalled elogs for truckers or electronic logs or at times electronic logbooks. Contrary to the common belief , e-logs and ELDs are not the same thing. This article reviews the difference between e-logs and ELDS, what are e-logs and how e-logs users are effected by the recent ELD Mandate. E-Log is the short version of Electronic Log. The new devices are called ELDs which stands for Electronic Logging Devices. This is where things get confusing. Most people who mention E-logs are referring to the On Board Electronic Logging Devices (OBLED). The new technology is reffered to as ELD devices. Those devices are connecting directly to the truck’s ecu(computer). ELDs and the originial Eloggers are doing the same thing. They are recording the miles driven by the driver. They both are using the electronic format. However, the new version of E-Logs has many added benefits. For example, the ELD system is more reliable, less likely to be manipulated and provide easier installation process. While Most truckers would have to comply by December 18,2017. The truckers that are currently using E-Logs would have an additional extension. However, the truth is that time is passing quickly. With Every day the demand for such ELD devices will increase. Additionally, there are still quite a few things that you may need to find out about the upcoming e logs for truckers Mandate. There are at least 7 reasons to switch from a paper log or the old fashion e-Log system to ELD devices. Lets review each reason and/or benefit in great detail. As it is with almost all major industry changes, there is definitely going to be a serious adjustment period. The earlier you implement the electronic logging the better. Early integration of the new technology can make the transition easy. Early integration provides more time to adapt. Carriers who switch to e logs for truckers earlier, will be ahead of the game compared to those who just start to switch when the mandate is in effect. Dispatchers and other company officials will learn to use those devices. Those company officials will in turn teach the drivers to use those e-logs. While there truly is a learning curve. truckers need to understand that these devices truly are easy to work with. Those e-logs will provide a tremendous amount of comfort and convenience before you even know it. Like every new thing, you would certainly have to spend some time getting used to it. There is no doubt about it. However, it is also true that as soon as this happens, you wouldn’t have to worry about it for long time. All those long days off that you had to spend logging your hours of service and mileage as well as others of the kind. Additional benefit is the maintenance reminders. The E-logs devices will alert the driver whether a maintenance check is due. ELDs are going to ease the overall burden of recording and remembering. Also, those devices are also absolutely impossible for you to lose. Just remember how many times you did actually lose your paper logs or forgot to go ahead and put something down. E-Logs not only ease the burden on drivers.E-Logs make the fleet manager's life a lot easier. Fleet manager can now check the e-logs in a click of a button. There are many apps which are used to filter data from those electronic devices. Those apps allow the pulling of information that is absolutely invaluable. Again, those applications are easy to use. Many drivers are against the new E-logs mandate. Those drivers known that speeding violations will be discovered easily by the authorities and fleet manager. Further, ELDs will lead to fewer HOS violations. and speed violations. As an added benefit ,E-logs are going to make the overall inspection process a lot quicker. E-logs for truckers, as when they are maintained properly, are a lot easier for different officers to read. Currently, they can be pulled using a USB stick. In the near future the elogs would be pulled using wireless technology. Many fleet owners and manager used ignore the driver's bad behavior. The reason behind this ignorance was better profits. However, now with e-logs technology becoming a mandate-- things will change. The drivers used to break the rules every now and then, will simply have to stop. 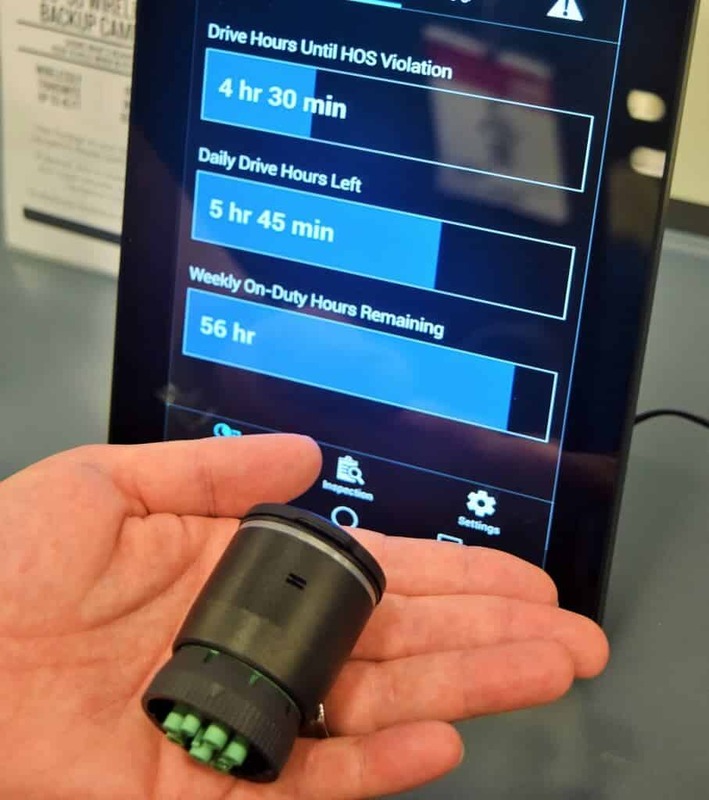 With an ELD conveniently installed and put in place, drivers are a lot less likely to be able to get away with HOS violations. However, using e-logs is not all bad. Drivers will be forced to drive less hours and at normal speed. This behavior will lead to less accidents. Less accidents will mean reduced insurance premiums. For a lot of drivers this is definitely going to be a relief. The professional drivers know that they are like athletes. They must adhere to the schedule now. However, e-logs for truckers would allow for high-end and precise time-keeping. Hence, this is something absolutely critical for the proper functioning of a fleet of any kind. A lot of drivers have also appreciated the fact that it allows the DOT officers to quickly conduct their inspections without wasting too much of their time. Most important is the prevalence of these ELDs has already had a profound impact on lawsuits. There were a lot of lawsuits filed against trucking companies . In a lot of the cases, logging the hours in an electronic manner is going to benefit both sides. Should an accident happen, it will be easy to prove that the fault is not with the trucking company. Even the most meticulous drivers are prone to errors. Similarly, book keepers and staffers can make a mistakes. It’s as simple as that. However, with ELDs providing a comprehensive logs that can’t be manipulated, there would be no doubt about any of this. Obviously, many men-hours are going to be spared. Most importantly, those hours will translate to higher productivity and higher profits. Every single second that you are not spending to log in hours, miles or whatever it is that you are required to do is time that you can make money. The same could be said about companies who would be able to overly optimize every aspect of the process that the driver has to go through – it’s as simple as that. As you can see, E logs for truckers are going to deliver tremendous value to trucking companies. Furthermore, e-logs will improve the life of some of the drivers. When accounting for all of the above benefits, E logs for truckers using ELD device is a great mandate. The earlier you do it, the more successful your trucking company will be. In summary, implementing E-Logs would put you ahead of the competition. While they are worried about figuring out how to take advantage of this technology, you would already be conquering new routes and opportunities.